Go outside tonight and see the beautiful sight of the slim crescent Moon, Jupiter and Venus in the western sky as it gets dark. 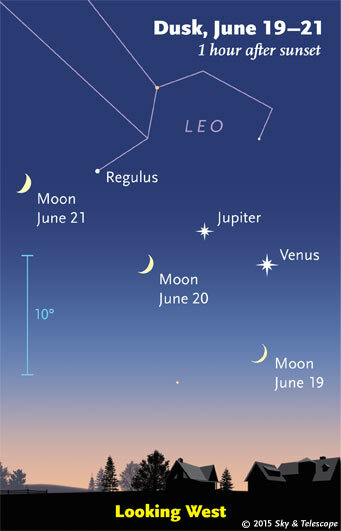 If you miss the sky view tonight the three will still be in the same section of the western sky on the 20th. Be sure to look for Earthshine on the Moon - that ghostly light on the dark part of the Moon caused by the reflection of sunlight off of our planet's clouds and oceans.